An original design created in response to local popular demand. 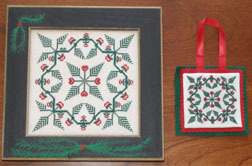 Full stitch pattern suitable for needlepoint, cross stitch, hook rug, etc. An Original Queenstown Sampler Design. Antique Ivory. Needlepoint Inc. silk, or DMC cotton. 32 Count Lakeside Linens, color – Examplar. 40 Count Lakeside Linens, color – Porcelain. Stitched in Au Ver A Soie, Soie d’alger. 36 Count Edinboro, color sand, available from Norden Crafts Ltd.